The first and only time I ever saw a ghost was back in college. I rented a room in the basement of an old house. One night I woke up and saw a diaphanous figure hovering by the far wall. Creepy, right? It should have been. Only it wasn’t. I watched it calmly, thinking, “Hmm, so that’s what a ghost looks like.” Then I went back to sleep. It was no different than witnessing a natural phenomenon, like the Northern Lights. Ever since then I have felt a friendly curiosity about ghosts. In fact, every book I’ve ever written has featured a ghost, in one form or another. 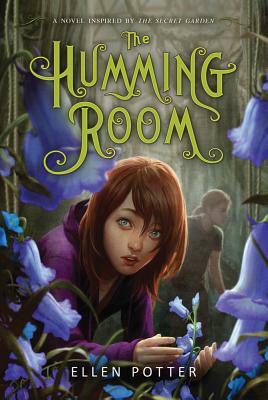 When I first started writing my latest book, The Humming Room, a retelling of The Secret Garden, I knew I’d be knee-deep in ghosts once more. The first thing I needed for The Humming Room was a haunted house. I explored many ideas, but in the end I chose a defunct tuberculosis sanitarium for children. In part this was because of a story that I had found about a haunted sanitarium reputed to be swarming with young ghosts. Stranger still, this sanitarium had a “body chute” down which they would send the poor victims of the disease to be whisked away for burial. A hidden chute seemed like the perfect device for a house that is keeping many secrets. Given my feelings toward ghosts, I guess it’s not surprising that the eeriest characters in The Humming Room are very much alive, while the ghosts themselves are pretty darn pleasant and normal. The three living children are wraithlike in their loneliness and wildness. The secret—the garden itself—also exists in the same murky half-life. Ironically, it’s the ghosts who bring the children, and ultimately the garden, back to life. Every so often I do wonder why that ghost appeared to me all those years ago. Unlike the children in The Humming Room, nothing very dramatic happened to me after I saw it. Still I’d like to think that it was an early nudge for an aspiring writer. Years later, the memory of that hazy figure in the basement inspired me to let ghosts drift in and out of my books. They are rarely scary in my novels. They don’t throw things at people or make the room smell like rotten eggs. My ghosts appear and disappear without too much of a fuss, just like that ghost in the basement. And sometimes, like in The Humming Room, they are even the heroes.